David released a new single this afternoon on iTunes called “Keeping My Distance” It features the guitar work of Raz Ben Ari and Toby Wilson. The accompanying video was produced by Shaun Ryan Savard at Playmaker Studios and features Canadian actress, Callayna Bajer. The song was mastered for iTunes by Andy Walter at Abbey Road Studio. Please check out Cyrus Rhodes’ Review by clicking on the link to the right. Please check out Angel’s interview with David at Sergeant Sparrow. WALKING TO DREAMLAND Available on iTunes! The new cd is now available on iTunes. The link below will take you to the iTunes store. Please check out David’s YouTube channel for the official video for the song”Walking to Dreamland”. 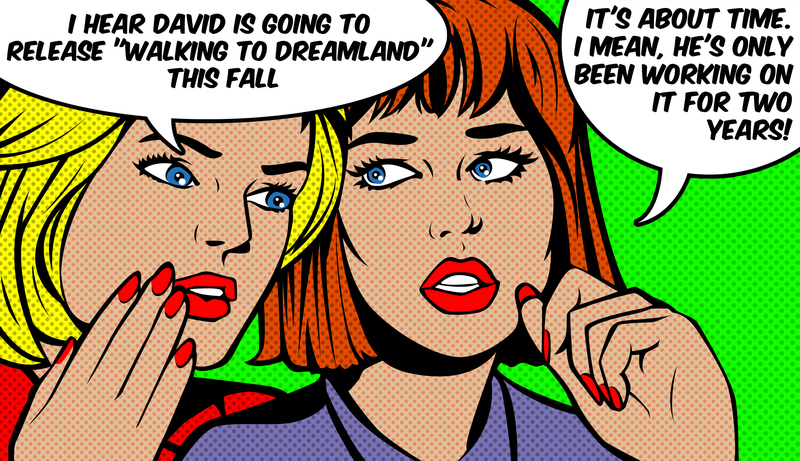 David’s new album “Walking to Dreamland” will be released to media in December 2014 and released on iTunes and Amazon February 1,2015. 10 new tracks. The album features contributions from Charlie Austin, Ted Doty, Melissa Hollick,Raz Ben Ari, Nicole Gose, Haines “Cowboy” Joyce,Francisco Benitez, Anat Nevo. Engineered by Rob Ulsh at Mastersound Studios in Virginia. Mastered by Yoad Nevo (Pet shop Boys,Bryan Adams) at his studio in London. If you are flying Delta Airlines this July and August, please check out Delta SKY Magazinefor the channel featuring David’s music. Jack in the earbuds, turn up the volume, sit back and enjoy “Andrea”.